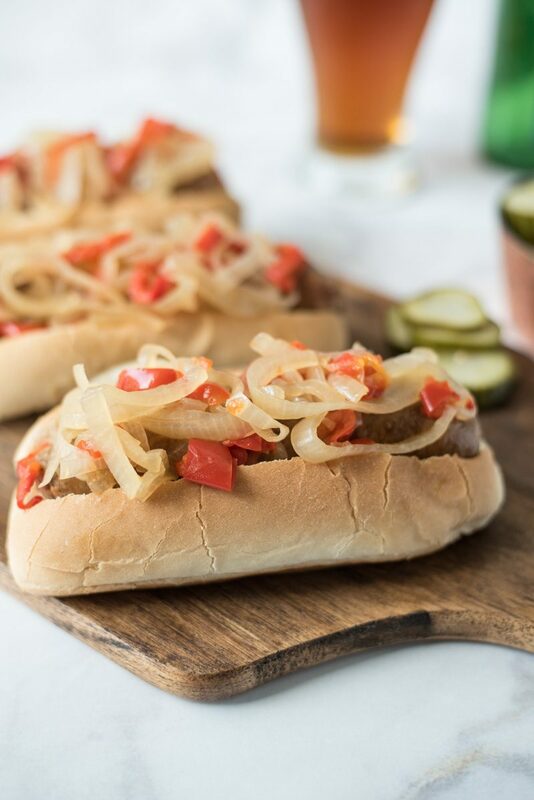 Slow Cooker Beer Bratwurst with Onions and Peppers are the perfect, easy cookout meal for a crowd. 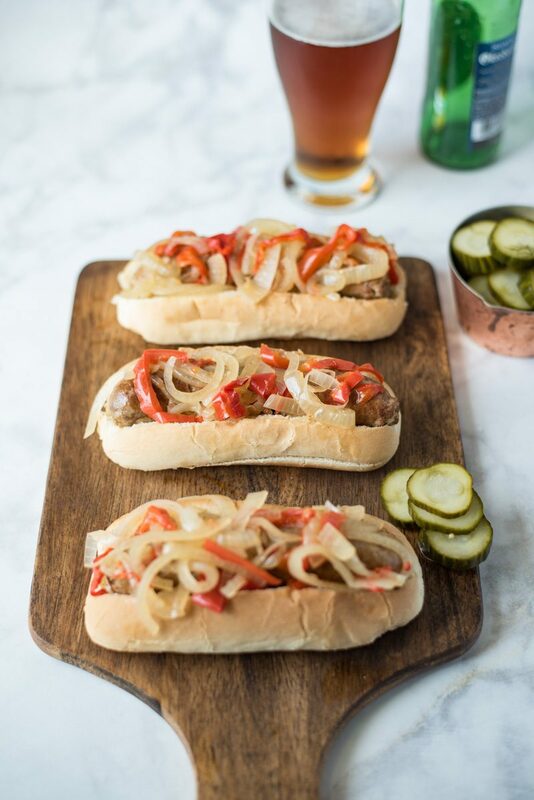 Brats are slow cooked in German beer along with onions and peppers, pile onto a bun and you’re set for a great game day. Want to take the labor out of cooking on Labor Day? Then these beer brats are for you. They will start cooking before your guests arrive. Once they are cooked you can turn the slow cooker down to low and they can bathe in the hot tub until everyone is ready to eat. Just set out the buns and condiments, then you can sit back and relax. 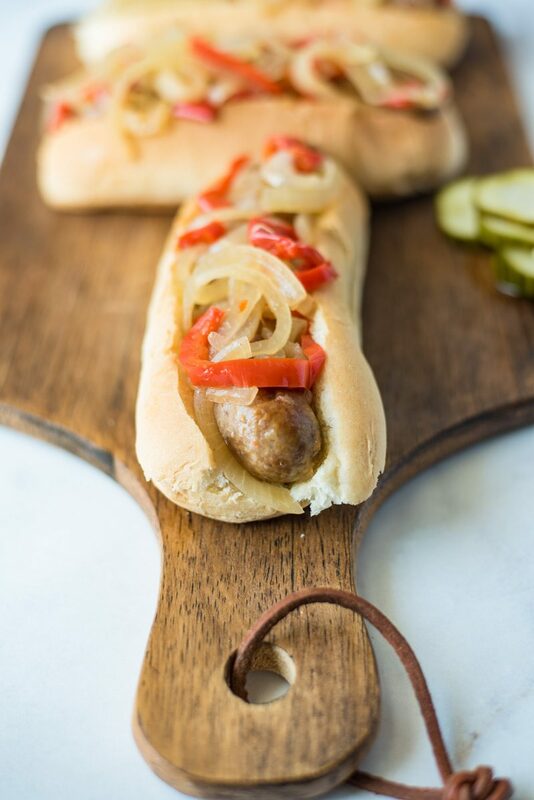 These brats are not just great for Labor Day and game day and tailgating, Oktoberfest is also a great time to enjoy these as they are German after all. I could live on sausages. I love all types from hot dogs to brats and of course, British bangers. My love of brats with sausage and peppers came about many years ago when I first starting dating my husband. Every year we would attend the Long Beach Grand Prix and see the Indy cars race. When we arrived at the track, the first thing we did was get brats and beer, which was usually breakfast. Before I came along, my now husband used to go to the race with his friend Brad, who then named the brats ‘dag nasties’. That name has stuck and we call them that to this day. This recipe is for 4 people, but it’s easy to double or triple the recipe. Just make sure you have a slow cooker big enough, or borrow a second one for the day. When you add all the ingredients to the slow cooker, it will look like there are too many onions and peppers, but they do cook down a lot. I bought my bratwurst from a local German market and there were a lot to choose from, but you can buy any bratwurst that your local supermarket carries. Serve topped with sauerkraut to make them even more German. 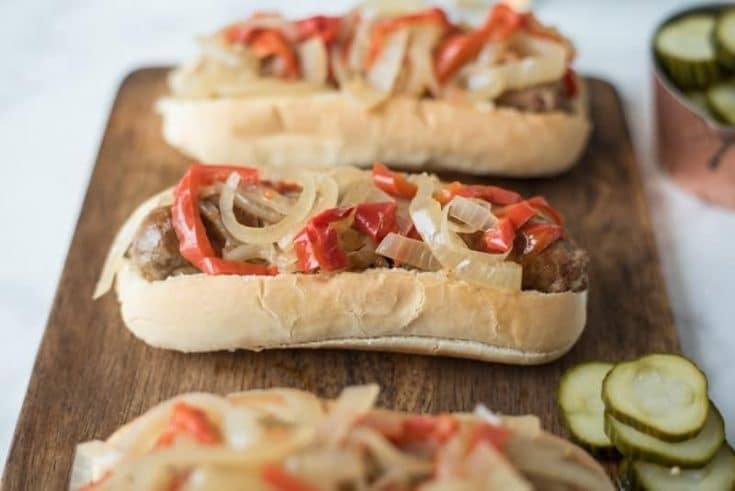 If you’ve tried these Slow Cooker Beer Bratwurst with Onions and Peppers or any other recipe on the blog then don’t forget to rate the recipe and let me know how it turned out in the comments below. I love to hear from my readers! 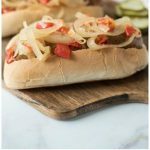 Slow cooker beer bratwurst with onions and peppers are the perfect, easy cookout meal for a crowd. Brats are slow cooked in German beer along with onions and peppers. Turn the slow cooker onto high to preheat. To a skillet add the oil over medium heat and brown the brats on all sides. Remove and add to the slow cooker. Top the brats with the onions and peppers, salt, pepper and butter. Pour over the beer and mix. Cover and cook on high for 4 hours or low 7-8 hours. This is a great recipe. Perfect for this weekend (and watching some football!). My guests will love it! Thanks! I’ve never thought to cook brats in the slow cooker. They look delicious!! Definitely putting these on the menu. I love Brats but never thought to cook them in a slow cooker and with the onions as well. Great idea! I have done my share of tailgating and brats are a MUST! 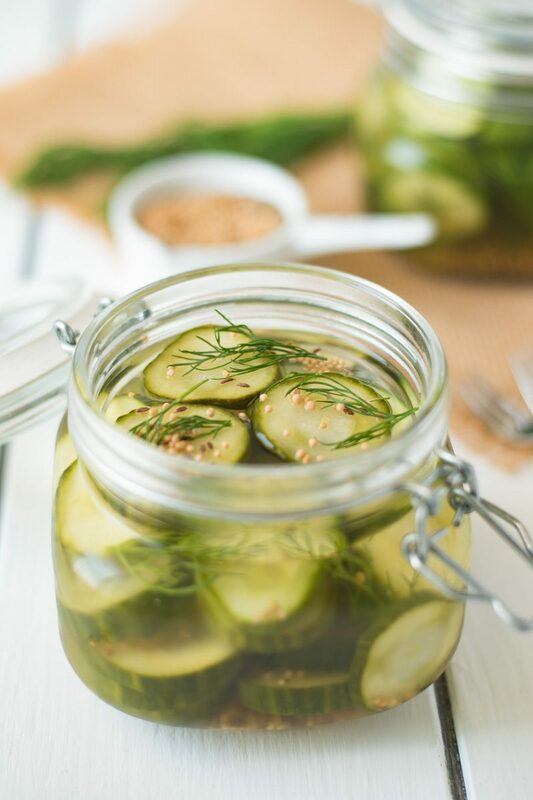 Your recipe looks delish and will be perfect for watching football on Sunday!! It definitely feels like fall here and I can’t wait to try this recipe! Looks so good! You’ve made a special classic into a very easy meal. Beer is a great idea! Cooking with beer.. yum.. !This sounds so delish. I love cooking in the slow cooker makes life so much simpler. Love the flavors you have here. Can’t wait to try.